On Sunday evening strolling to the Sunday quiz at our local pub. I wave to Neil and Sue but I don't wait for them. They're too far away. I cross the pelican crossing on Ecclesall Road and just as I reach the opposite pavement, I become aware of some shouting further down the road. I walk on. Causing a passing car to screech to a halt, I see a young man running towards me, hotly pursued by another young man who is holding a weapon - a bat or club of some description. The aggressor is shouting that he is going to kill his prey - "You're f---ing dead mate!" As the young man gets closer to me he yells -"Help me! Help me!" I sense the panic in his voice. I have never seen the young man before and I have never seen the hunter. I don't know what it is all about. The hunter gives up his chase and I turn to the quarry, shouting "It's all right! You've got away. Just keep running!" The young man turns the corner but he's slowing down - he thinks he's got away. Club-man retreats to a parked car - a battered old green vehicle with an ancient "B" registration plate. He jumps in. There's someone in the passenger seat. Putting his foot down, the ancient wreck of a car screeches upto the corner. Momentarily, I picture the victim, sauntering along feeling a huge sense of relief that he has escaped the nutcase with the club. Then the green car brakes to a halt and the nasty bloke jumps out with his bat. I replay the words"Help me!" again and again. What could I have done? What should I have done? The parable of The Good Samaritan is a story that contains a moral message which I have always identified with. And yet there I was being asked for help by a young man with fear in his eyes and really I did nothing. Lord knows what happened round that corner. It was Easter 2005. One of the best trips I ever organised. After Santa Monica and Los Angeles, we drove up to Las Vegas and the Grand Canyon, then back to Bakersfield via Boron and along the rich Central Valley, detouring to the breathtaking Sequoia National Park and then on to beautiful San Francisco. Three days there living on Lombard Street then down to Salinas and the Steinbeck Center, and onwards along the famous coastal road past Big Sur with its marine vistas. We stopped at San Simeon Beach to see elephant seals lounging in the sand and then it was back in our black Jeep heading for Santa Barbara County. At the humble, down-at-heel agricultural settlement of Guadaloupe, I went into the gas station and asked if there were any hotels in town. "There ain't no hotels here", chewed the bored young woman behind the counter, "try Santa Maria". 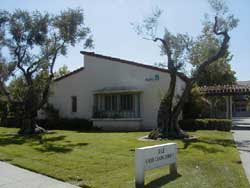 Another three or four miles and we were in Santa Maria. I had imagined that all hotel rooms would be taken because of what was taking place in the Superior Courthouse. However, I was wrong. We had no trouble booking into the cheap-as-chips Rose Garden Inn on East Main Street. After showering, preening and then eating at Denny's we headed up to the courthouse. It was pitch dark by now. I guess I was expecting crowds of fans there but there was no one. We had seen the scenes on television - crowds of fans with placards, cavalcades of motor cars, police officers, sirens. But that night East Cook Street was as dead as a ghost town in a cowboy movie. Only the tumbleweed was missing. Squeezing through temporary barriers, we edged into the court complex when from behind a bush there appeared a small bearded man with a flashlight. He was a gruff security guard. I soon engaged him in conversation. He said he was happy that the court case was rumbling on as it had given him a couple of months of reliable income. He wasn't complaining. We shook hands with him and before I squeezed back through the barriers, I asked "Are you a Michael Jackson fan then?" He paused and grunted, "No I ain't mister! I'm a me fan!" That was the closest I ever got to the legendary Michael Jackson. To be honest, his sort of music and razzmatazz never appealed to me but I cannot deny that he contributed to the soundtrack of all of our lives these past forty years - you could hardly avoid him - and he genuinely touched the hearts of millions. 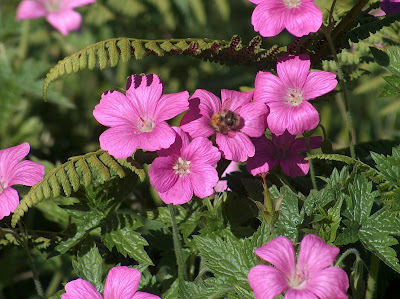 A bee at work in our garden. Perhaps surprisingly, I love the British climate. I love its unpredictability - whereby we may experience lovely warm days in mid-February, freezing winds in July, rainstorms in just about any month, mild green winters or arctic tundra. You never know what you're going to get - rather like Forrest Gump with his box of chocolates. And so unsurprisingly, weather is a popular conversation theme with British people. I can't imagine that in Alice Springs, Death Valley or Saudi Arabia where weather patterns are much more predictable. Today it is quite lovely. As I sit here typing, the outside temperature is already a pleasant twenty degrees and rising with the afternoon scheduled to reach twenty four. 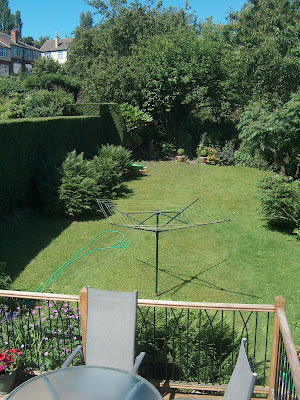 The sky is clear blue and bright sunshine is beaming down on our garden - a little green oasis in a big northern city. The other day I found an abandoned blackbird's nest complete with four little eggs in an overgrown bush I was hacking back. It seems that only one in ten blackbird nests in urban areas successfully produce fledglings. A big slimy frog was living under that monstrous bush. He looked at me as if to say "What the?" before hopping further into the undergrowth. Shirley had been asking me to tackle the offending border for months. I created a new space for plants and enriched it with our own household compost - from the bin where the spaghetti worms writhe their lives away in black plastic darkness. 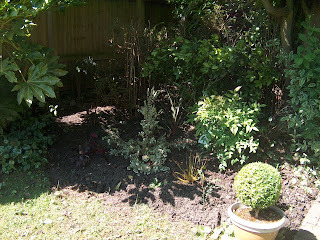 We went up to Wentworth's magnificent garden centre and to B&Q to pick half a dozen new plants which I have promised will not be smothered by the re-advancing bush that had over the years turned into the shape of that massive stone ball in the "Indiana Jones" movie. Walking out in the sunshine. How lovely it is to live in Yorkshire, England. You can keep your apartments on the Costa del Sol, your rural retreats in Tuscany, your condominiums with pools in Orlando, your Sydney Harbour views. Why can't people make the most of what they have got, appreciating the world around them? Looking up the garden from our upper decking. The border I have been working on. It's been a while now since my nasty little operation. I have been off work ever since. There has been pain and there has been blood but fingers-crossed, things are feeling rather better now. Last week was a first for me - my first doctor's note - giving me licence to be off work for a further seven days. I may as well take it. I owe the school where I work no favours and I will be leaving there in less than a month anyway. I saw a job in the Times Educational Supplement. It's about promoting global understanding through school-based activities - developing resources, trialling and evaluating them. It would be so different from what I have been doing for the last thirty years. I have completed the online application form but then hesitated. I am not sure it's what I want to do but it would bring in decent money. Maybe I should just click and send it. The likelihood is that there's somebody lined up for it anyway. Who knows. There aren't many pictures of me connected with the job of teaching. I have always been a keen photographer but a very reluctant subject. I came across two photos that other teachers snapped of me - both of them around twenty years ago. 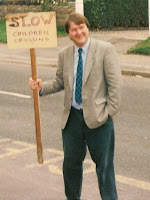 In one I am holding a homemade sign linked with the school's annual cross country run. Perhaps it is an instruction to drivers to slow down because of runners crossing or perhaps - and this seems more likely to me - a declaration that the children who are about to cross the road are intellectually challenged. 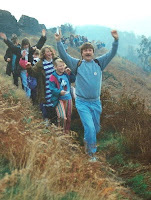 The second picture shows me behaving like the Pied Piper of Hamelin on the school's annual sponsored walk. I am leading the slow children into the cave. The entrance will magically close behind them and I will be left with a crippled youth called Hans or maybe Herman. I think of that workplace - the hours I have put in , the weekends, the sleepless nights, the times I have gone the extra mile and I wonder - will this be all that's left to show - two photographs from twenty years back? Work. It's a much over-rated activity in my view. 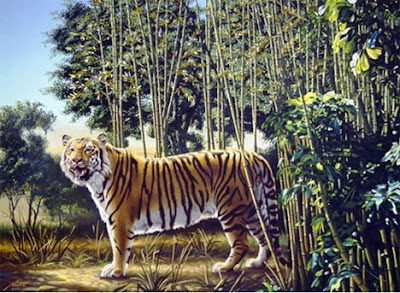 In this "illusion" we can all see the tiger but can you also see the hidden tiger? Look carefully. This optical illusion has been doing the rounds for a few years. You have probably seen it before. Stare at the four black dots in the middle for about ten seconds and then stare at a blank sheet of paper or a light coloured wall. At first you just see a rough circle of light. Then the miracle happens. Christ is born again! I believe! I believe! 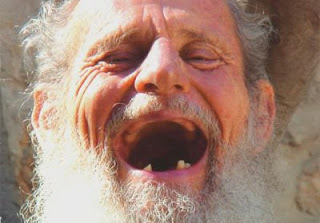 ...Mind you, it could be Charles Manson! These photos are from Lourdes, in the foothills of the French Pyrenees. I snapped them in August 2007 as we made our way from Biarritz to my brother's property further east. In Lourdes, there were dozens of souvenir shops selling all manner of tacky keepsakes linked with fourteen year old Bernadette Soubirous's claims she had repeatedly seen visions of the Virgin Mary on the edge of the town back in 1858 - St Bernadette fridge magnets, toothbrushes, boiled sweets, nail clippers, snowstorms from which a tiny plastic Bernadette emerges staring permanently at an equally tiny Mary mother of God. Nowadays, Lourdes has more hotel rooms than any other French town or city apart from Paris. It receives around five million pilgrims and visitors a year. See some of them in my first photo - lined up at an open air service - in their wheelchairs, pathetically hoping to be "healed" by spring waters from the sacred grotto. You see people filling bottle after bottle with holy water, drawn from pipes that run out of the holy spring and there are massive candles you can light too - some of them so big it takes two men to carry them. In Lourdes, I felt like an alien. All these busloads of people from all over the Catholic world. Did they really believe the legend - something not far removed from a fanciful fairy story? Inside, I was utterly bemused. For me it was like visiting Madame Tussauds - that kind of curiosity - but for the other people, the nuns, the cripples, the rosary-rocking water gatherers and grey-haired coach travellers - Lourdes was something different - something they so desperately wanted to believe in that just being there strengthened rather than diminished their religious belief. It was quite scary. Like a growing percentage of earthlings, I repudiate all religious belief and live without a god or any expectation of an after-life. We of the non-religious creed that puts people and earthly happiness first would even go so far as to blame religion for millions of deaths in hundreds of conflicts which grew out of religious bickerings, misunderstandings and jealousies. Regarding faith - I have faith in the essential goodness of people, faith in the beauty of nature and in man's creativity, faith in tomorrow, faith in our oligation to make the most of this life, relishing experience and finding peace... or am I starting to sound like a preacher at Lourdes? 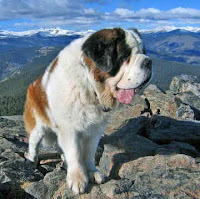 A St Bernard perhaps? He who was lost is found again. I remember looking up at the electric clock in the ante-room. Next thing I knew, I was in the recovery room. "Errr...Is it over?" It was. They wheeled me back to my "private" room with my new best friend - a white "Bristol Maid" stand holding a bag of urine that was connected to me via a couple of metres of clear plastic piping. I lay there all afternoon in a sort of stupor, occasionally glancing out of the window at a banking of lush foliage which no birds ever seemed to visit. Intermittently, nurses popped in to take my blood pressure and a kitchen assistant brought me a very cold egg sandwich and a cup of tea. I tried to read "Let Us Now Praise Famous Men" but the style was too idiosyncratic for my woozy mind. It was strange being in that hospital - in a private room with your own television and en suite facilities. I didn't get to meet any other patients and hours could go by without seeing a single member of staff. A couple of times I was forced to press the nurses' call button to prevent my new best friend from bursting and to order extra jugs of water. Leaning on the window sill, scanning the banking for avian life, all that was missing was iron bars. I already had the striped pyjamas. Seven thirty on Friday morning, the night nurse finished her shift by gently tugging the catheter out and disconnecting me from my "Bristol Maid". Good Lord! What nastiness. I grimaced like a drama queen. But this was nothing when compared with my first post-operative piss. Shards of glass and broken razor blades spring to mind. I'm home now. Urination is becoming easier but there's still more healing to happen. I wouldn't wish such trauma on my worst enemy. Thanks to fellow bloggers for their good wishes. The Yorkshire Pudding is back! Sitting in my spider infested cell, waiting for the hours of darkness to pass and then as the pale sun breaks I will take the long walk to meet my maker. That's how it feels. In thirty two years of teaching, I have never had a single day off for health reasons...that is until tomorrow when I begin a ten day spell of absence following a hospital operation. I have been waiting for it since January. It all harks back to the e-coli infection I had last summer. Investigations at the time and after Christmas showed that my urinary functions are not A1. My bladder never empties completely. I have to have surgical intervention. The operation is, I understand, called a urethrotomy. What a horrible word! And what a horrible idea. General anaesthetic and strangers fiddling around in your nether regions when you are dead to the world. After England trounced Andorra 6-0 this evening, I was straight down the pub. I could have happily consumed a firkin of ale to blot out the idea of this forthcoming surgery. I hate hospitals and white-coated people with stethoscopes. To add insult to my psychological injury, they are putting me in a private hospital because my government waiting time window is about to end. I have always been a fervent supporter of the UK's National Health Service and I hate the idea of lying in a bed meant for the self-congratulating rich. The thing is that if I had waited for the NHS Hospital, the operation might have been delayed till August. The prospect of reaching a point where you simply cannot urinate does not bear thinking about. Of course, it could all go wrong and this could be my last post. Can you hear the bugle? Undoubtedly, there is no God but God-willing I will blog again at the weekend. Pray for me fellow bloggers. Pray for me. I can already hear my warders' footsteps in the corridor. 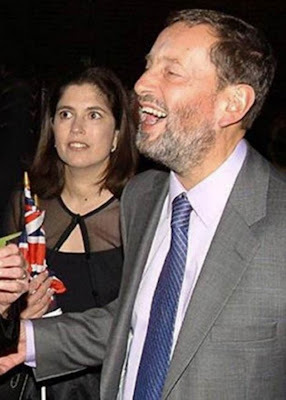 Oh dear, blind Sheffield MP and former Home Secretary, David Blunkett, was attacked by a cow at the weekend while walking near his publicly funded quaint Derbyshire cottage on the Chatsworth estate - some twenty miles from his Brightside constituency. This self-proclaimed man of the people has of course suffered at the hooves of cows before - notably the American heiress Kimberley Qunn who bore Mr Blunkett a son - William - in spite of her protestations that the kid was her husband's spawn. That publicity brought the shutters down on Blunkett's promising ministerial career. Who knows - instead of Gordon we might have had David. I have met Mr Blunkett on several occasions - mostly because I taught his three older sons - all born in wedlock during his marriage to Ruth. The three lads were very nice. Alistair was the oldest. I remember Blunkett sending me a letter on House of Commons notepaper declaring that Alistair could get a C grade in English. In the event he got a D grade. I wondered at the time - what can a blind man know about the appearance of words on paper and why was he so sure that Alistair could make a C grade? His wife was much more realistic about the lad's literacy skills. The middle boy, Hughie, was the brightest of the three and had a certain intellectual edge to him that he must have inherited from his father. Many Sheffield people despise what Blunkett became and how he left his roots behind but I have always had a sneaky admiration for him. 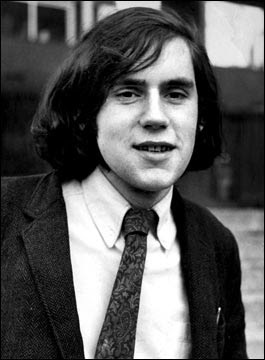 To become leader of a city council at a very young age, then an MP, then a minister and Home Secretary - such achievements were testament to his self-belief, his hard work and his refusal to let a major disabilty stand in his way. 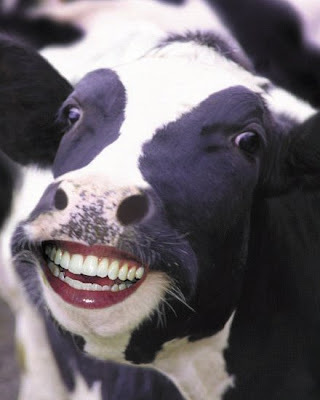 It's hard to knock somebody like that...unless of course you're a cow! No doubt Gordon Brown is a good man. No doubt he is intelligent and no doubt his economic understanding underpinned the "New" Labour Party's successful first ten years in office. However, he wasn't elected to be prime minister by the British people and in lots of ways he doesn't come across as a proper leader. Emily Bronte once wrote that "the eyes are the windows of the soul". I know it's unfortunate and perhaps not a little "disablist" but when you look into Gordon Brown's eyes you see a furtive creature of the night who cannot establish proper eye contact. The interminable debate that foreshadowed Brown's succession to the Labour throne turned my stomach. We, the British people, did not pick him. He appeared to have risen to this position as if it was his God-given right! I despise the renegade nobodies - Purnell, Hutton and Flint - with their arrogance, their disloyalty, their weasel words and their strategically delayed ambitions. However, weighing things up, seeing how things are, it is surely Gordon Brown's time to go. I have no idea who might replace him or become the next prime minister. I fear the idea of Cameron entering Number 10. His priorities, though purporting to be inclusive, will, without a shadow of a doubt, favour the wealthy, landowners, business magnates, insurance brokers. Tories always look after themselves first. Soon after election that wolf would cast off his sheep's clothing. 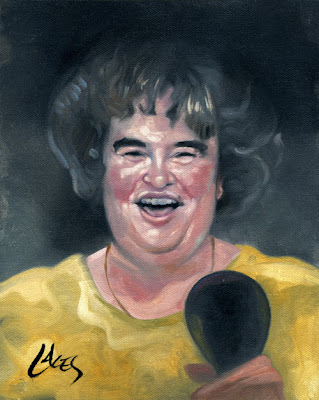 Poor Susan Boyle. She proved that beauty certainly can be found in unexpected places. Didn't she sing that song so well! I examine the lyrics and there I find echoes of Susan's own humble life and the experience she has had in the public spotlight and at the hands of our ruthless media. "No song unsung", the tigers that come at night "turn your dream to shame", "But there are dreams that cannot be" and finally "life has killed the dream I dreamed". How brave of this simple woman to stand alone in the full glare of the media machine and to sing her song so sweetly. She really did dream a dream and if you're reading this blog Susan, I'm sorry that I previously posted a picture of you as a Yorkshire pudding! You're not, you're a flower of Scotland and I hope you find a way back to your simple life in your unexceptional Scottish village. 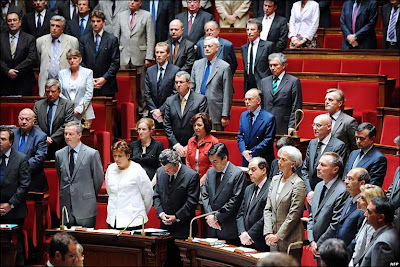 Above, the French parliament stand in silent remembrance of the lost 228 souls aboard Flight AF 447. 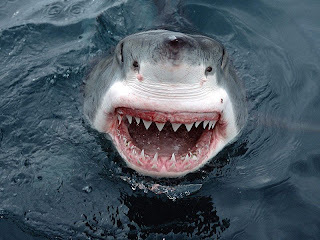 Somewhere in the middle of the Atlantic Ocean, they rest in their watery grave. Most of us have travelled on aeroplanes. We have read the safety announcements and buckled our seatbelts but even as we pop the earphones in for the latest in-flight movies or unwrap our plastic cutlery, somewhere in the back of our minds lurks a nagging fear of aviation disaster... it's always a possibility. Every year of my adult life there seems to have been at least one tragic plane crash somewhere on this planet. I think the worst thing is having no control. You know the plane is plunging down and yet there is nothing you can do. You can't swerve or jam on the brakes. You can't smash the window and leap out or run to the emergency door and grab a parachute. You're doomed. Passengers are either deathly quiet or screaming. Your ears are popping. The end is nigh. You crumple at the fierce impact as the aircraft hits the water or as it sinks you breathe in the ocean, trapped in your communal coffin. Flight AF447's passenger list was dominated by French and Brazilian citizens but many other countries were also represented from Turkey to Taiwan, Iceland to England. Let us join with those French politicians and commiserate quietly for the lost ones, their lost hopes and dreams and the heartbroken friends and families left behind. You know - it could have been me and it could have been you. R.I.P..